1. What is your full name and its origin, or how was it given to you? Are you named after anyone? Do you have any nicknames? a. Michael Scott Brown, of the Allen County Ohio Brown/Spencer/McClure/Graham families… McClures settled Allen County first. b. I’ve been called many things, some funnier than others. Downtown Mike Brown seems to be the most common. 3. Where do you live in Harrison West? Do you own your house or rent? b. Purchased a rental property in 2003, and slowly fixing it up ever since. 4. If you own your house have you done any significant renovations to it? Please describe. b. New Roof, AC, Furnace, Water heater, 2 rebuilt bathrooms, all new hardwood floors, all new kitchen down to studs, new carpet upstairs, new iron fence installed along with multiple neighbors for uniform look. Mostly done with my brothers and Brother-In-Law who is a carpenter. 5. How long have you lived in Harrison West? a. Various places since 1998, lived on Harrison, Thurber Drive, Bradley and Pennsylvania. Also lived in Short North for a year. 6. What brought you here (HW) and where did you live before? a. I moved to Columbus after college and work in Chicago. Came here to work for the wonderful Dispatch Broadcast Group as a news producer. b. When I moved to Columbus a friend and I had our first meal, before unpacking car at Mac’s in the Short North… which I love to this day (Thanks Beth). I liked the area and at the time it seemed to be where all the young cool kids were living, and it was affordable. Multiple apartments later I finally bought a house. c. I bought in Harrison West after looking at Clintonville, Berwick, and other areas, because at the end of the day I wanted to be in walkable distance of Short North, Arena District, downtown. d. I worked with the legendary Mary Funk, who persistently encouraged me to be her neighbor, so I bought the house next to her and Roy. It was very hard to say no to Mary. 8. How did you end up in Columbus if you are not from here? 9. Did you go to college? If so, where and what did you study? 10. What do you do for a living? How did you end up in that occupation? 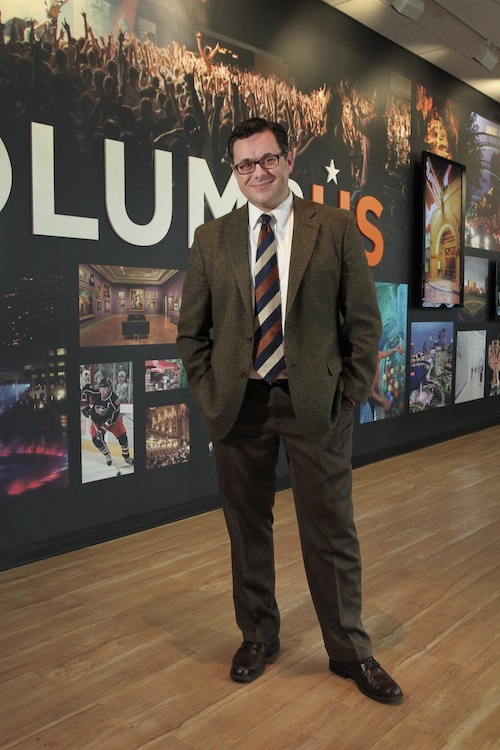 b. I love Columbus, after working 11 years for Mayor Coleman, I felt that Experience Columbus was an awesome place to help tell the Columbus story to a broader world. It is an awesome place to work. a. Because of my job, basically all I do is have fun. I spend a lot of time at restaurants, for work and play, but also all the major events in town. b. Live music, especially the local scene at Kobo, Ace of Cups, festivals. I helped start Independents’ Day in September, which I truly love. c. Backyard smoking of meats… curing of bacon.. BBQ… much thanks to Bluescreek Meats and North Market Spices. 12. Do you live with anyone (partner/spouse/kids)? Tell us about them. 13. Do you have any pets? If so what are they and what are their names? a. Taylor, 13, German Sheppard Mix from the pound. 14. What do you like about living in Harrison West? a. Close to all the cool stuff, but still a quiet, urban neighborhood. Very interesting and diverse neighbors. 15. What are your favorite places to go out? Do you frequent any of the neighborhood businesses? a. I spend a lot of time in the Short North, Downtown and Grandview areas… my bubble. b. Mac’s, the Short North Tavern and Park Street Tavern are my favorite places to hang out with friends, but we really love to ramble around from place to place. c. Katalina’s and Café Brioso are my breakfast spots. d. De Novo downtown is something I’ve been enjoying a lot lately, great brunch. e. I love the Southern and Lincoln Theatres and go to many shows, especially the Columbus Jazz Orchestra. If you’ve not seen Byron Strypling and Bobby Floyd, go now.